Men’s and women’s basketball play semifinal (W)NIT games while tennis and baseball seek conference supremacy. Kouat Noi (left) and Amy Okonkwo (right) shoot to deliver their teams to (W)NIT championship games this week. Courtesy TCU. Frog fans are busy. Aside from the standard hustle and bustle of work-life-family, it’s a full-time job to keep pace with TCU successes during end-of-season tournaments and conference clashes. We’ll start with basketball, both men’s and women’s, who are within layup-distance of (W)NIT championships. Coach Jamie Dixon’s rotation has diminished throughout the season due to injuries and transfers. Seven hoopers remain who play quality minutes and the majority of each game. The swishing seven have all had moments in the spotlight throughout this season, and last Tuesday’s quarterfinal match-up with the Creighton Bluejays was no different. Junior Kouat “Who’s your Boy?” Noi sharp-shot his way through the conference schedule but had been quiet in the NIT while his brethren carried the load. 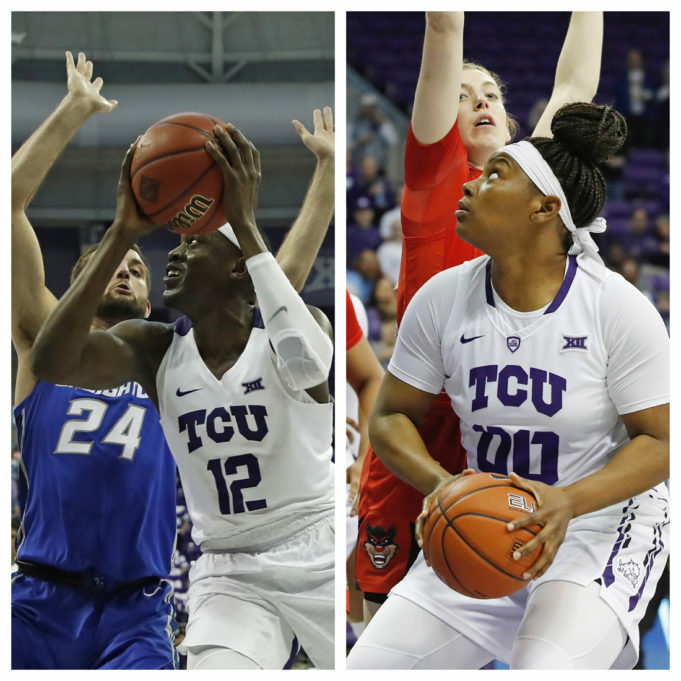 Noi lit up the scoreboard against Creighton and led all scorers in the game with 25 points and had the second most rebounds of all Frogs with seven. Dixon’s dribblers lagged from the tip against the Bluejays and caused Frog faithful consternation when the home team trailed by three at halftime. The Frogs don’t have an encouraging win percentage when trailing at the break. Fort Worth’s finest wasted no time in the second half and quickly alleviated all concerns with the help of Noi’s outside shooting and senior JD Miller’s inside prowess. The Dixon defense locked down the normally powerful offense of Creighton and held them to a piecemeal 25 points after the break. Frogs win 71-58 to advance to Madison Square Garden. By the time you read this, TCU and Dixon will have either dunced Texas coach Shaka Smart again or dropped their first game in three clashes with the Longhorns this season to miss playing for the NIT championship. The return of Longhorn guard Kerwin Roach II elevates Texas’ half-court presence. Roach was suspended for violating team rules when TCU visited Austin to end the regular season. UT forward Jaxson Hayes hasn’t appeared in the NIT yet and has been ruled out for the tip against the Frogs. Hayes continued the purple’s struggle with athletic big men last time the two played. If Horned hopefuls had to choose, it’s better for Roach to be in and Hayes out. There is no reason to think Dixon will suddenly be out-smarted by Texas. He is likely to add a neutral-site victory to his home and away collection this season. The winner of TCU-Texas will play for the NIT championship on April 4 against the winner of Lipscomb-Wichita St. I’m calling for a rematch in the NIT championship between the Frogs and high-scoring Lipscomb, a team that beat TCU by nine way back at the beginning of the season. Coach Raegan Pebley’s Lady Frogs are also shooting for an WNIT championship and visit Tucson on Wednesday to take on the Arizona Wildcats in their semifinal match-up. Our ladies easily dismissed Prairie View A&M in the opening round of the tournament before dunking UT-Arlington in the second. The third-round tip against Arkansas was their tightest to date, but the Frogs bested the Razorbacks by four. Pebley’s players rolled against Cincinnati by 14 points on Sunday in the WNIT quarterfinal and have looked dominant, scoring nearly 70 points per game this season while shooting an impressive 30 percent from long range. Did you know opening day was last week? I don’t care either. The Texas Rangers are going to be terrible, but the diamond Frogs have been playing since February and are excellent as usual. Coach Jim Schlossnagle’s boys of summer aspire to make their sixth trip to the College World Series in Omaha and hope stellar offense will deliver them. Frog baseball is 17-9 and suffering a two-game skid after consecutive one-run losses to the Oklahoma State Cowboys. Frog baseballers aren’t exempt from injuries and are starting to feel the sting of lost players as much as football and basketball. The Frogs are currently ranked 19th but may drop after their two-loss weekend. Much more baseball to come in Buck U. as the buzzer looms on basketball season. Alex Rybakov (left) is the #4-ranked singles player in the nation. 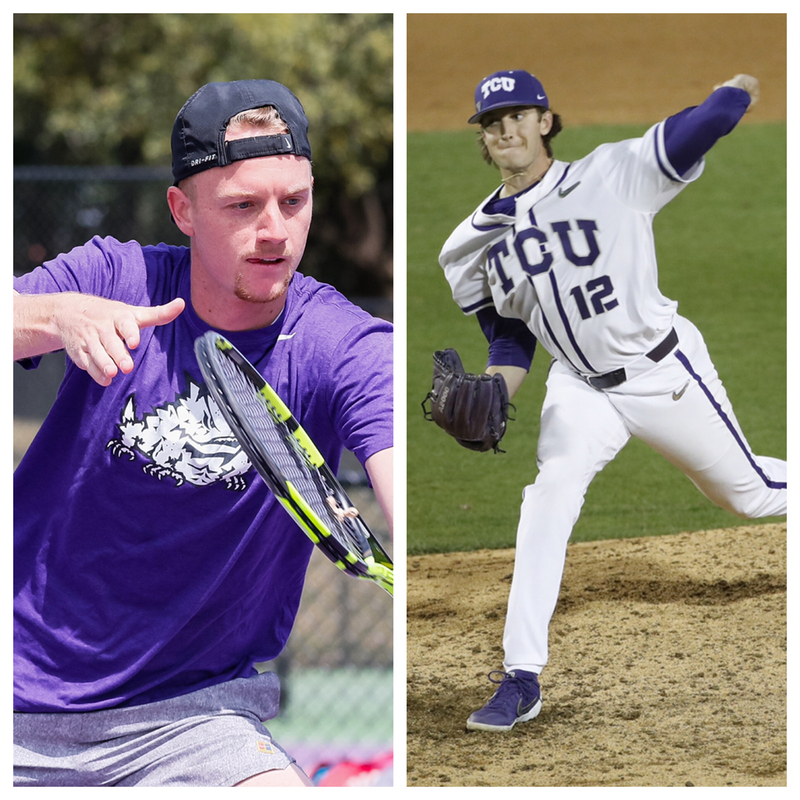 Left-handed pitcher Nick Lodolo (right) is the junior ace that will be vital to Frog baseball’s postseason plans. Courtesy TCU. TCU men’s tennis has dominated the conference in recent years but is in a deuce-point-or-die situation for the regular season crown. Coach David Roditi’s racquet Frogs dropped their first conference match since 2017 to the Baylor Bears last week before acing Tech. On Saturday in Fort Worth, our boys have a home match against third-ranked Texas, who beat Baylor and are undefeated in conference play. It seems that the Longhorns have transitioned past the loss of their fired coach Michael Center, who was dismissed from the university after being charged with conspiracy to commit mail fraud related to a high profile pay-for-admission scandal. TCU will need to volley past the Longhorns and receive aid from the rest of the conference to have a chance to repeat as regular season champ. The Big 12 field is stacked with teams in the Intercollegiate Tennis Association Top 30 rankings. The Frogs are currently ranked 13th, the Bears 11th, and the Longhorns third. Roditti understands that tennis doesn’t draw huge crowds and kindly entices onlookers with free admission, pizza, tacos and a slew of kids’ activities for spectators. My suggestion: Take the family out to the TCU tennis center on Saturday at 3pm to sunbathe and witness two tennis titans serve up excitement.